September brings beautiful weather and the promise of amazing events to come over the next few months. It also brings with it one of the most beautiful birth stones of them all: Sapphire. This royal gemstone invokes warmth and comfort to all those who wear it. Vanna K is proud to feature sapphires in many of their unique jewelry pieces, including this beautiful diamond and sapphire designer engagement ring. This vintage-inspired ring is both regal and elegant. Like many Vanna K creations, it's the details that make it unique and beautiful. Hand-engraved by the finest artisans, this ring has extraordinary elements. From the 1.5 carat fancy-cut emerald shape that stands out as the centerpiece to the broad planes surrounding it, this ring is classic beauty at its best. The bold contrast of the the sapphire baguettes (1.08 total carat weight) next to the round diamonds (an additional .26 carats) creates a powerful elegance that captures both eyes and hearts. Give this one-of-a-kind beauty to someone who deserves something different, something special, something regal. 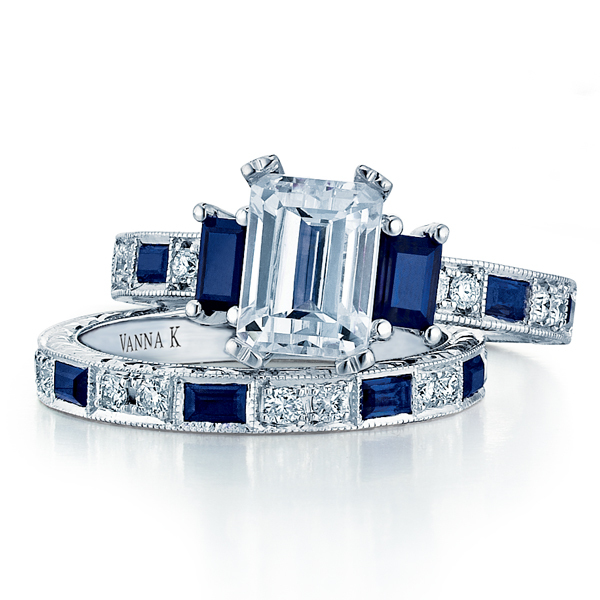 Find this and other unique diamond engagement rings today at Vanna K.